My search for the best driving roads in Japan hasn’t gone quite as well as I had hoped. So far the biggest problem I’ve faced was traffic getting to the roads themselves. When I went to the Hakone Turnpike in the MX-5 Miata RF it was raining, but that’s not really a deal breaker as it was quite fun in the wet. Going to Lake Miyagase, Mount Akina and Akagi involved plenty of sitting in the car before getting to the actual touges. But nothing has gone quite as wrong as when I went to check out the Yabitsu Touge. The distance from Tokyo wasn’t too bad, only about an hour away on the motorway. On Google Maps it looked like a promising road with lots of sharp turns and hairpins leading up to the south side of Lake Miyagase. It was supposed to go well. For this trip I enlisted the help of Alpina Japan who provided me with their new B5 Biturbo super sedan to help find this road. Conditions were well suited for trying out a new road; it was a clear and sunny day. Setting off from Tokyo went well and the drive on the Tomei Expressway, which is usually just bumper to bumper traffic, went smoothly too. It was only when I got to the start of the Yabitsu Touge was when things started to go wrong. The roads were a lot narrower than they appeared on Google Maps. I know, my fault for not double-checking but these supposed two-lane road was the exact same width as the large Alpina B5. To make matters worse, halfway up the tight and twisty touge the road was shut due to a landslide the night before. Shoutout to the local for warning us to turnaround at the viewpoint saving us an awkward moment further up. The first half of the Yabitsu Touge was pretty fun. It was a small and tight road probably better suited to something like a Mazda MX-5 or Honda S660 than a massive luxo-barge like the B5. In a car as big as that it felt more like a challenge getting through the narrow gaps than a fun blast up a mountain road. After parking up and having a quick look at Google Maps (side note, in-car sat navs should have fun driving roads preprogrammed into their points of interests), I found an acceptable Plan B near Yamakita towards Mount Fuji. If you like driving on bridges, this is the place for you. The road goes past Lake Yamakita and basically goes all the way to a dead end. On the plus side there’s not much traffic to worry about, the negative is it’s not the longest road to enjoy. Luckily, there are other roads in the neighboring area to explore which are just as fun. The area around Mount Fuji is always a good area to explore with the mountainous terrain offering a good excuse for tunnel blasting—and the scenery never disappoints. Yamakita is also about 30 minutes away from Fuji Speedway, so if you’re visiting for an event or a race, this is a good area to kill some time afterwards if you feel inspired from watching cars go around the famous circuit. The Hakone Turnpike isn’t too far either but unlike the Turnpike the roads around Yamakita aren’t toll roads. You can enjoy driving here as long as you want free of charge. This is exactly what I did with the Alpina B5. Think of them as BMW’s partners in making their high-end cars even faster and posher. Alpina has been popular among the well-heeled in Japan selling since the 1980s. 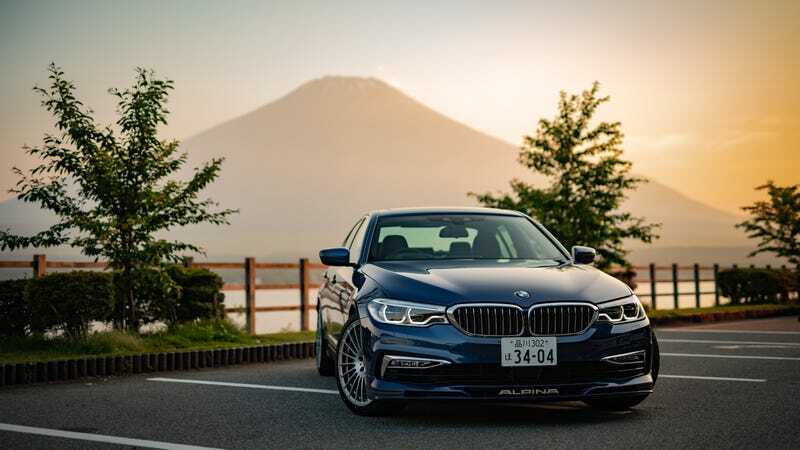 Around 400 of these uber-exclusive cars are sold every year, making Japan Alpina’s second biggest market after Germany. Around half of their sales are made up of the 3 Series based B3 and D3 models. Alpina offers its whole range from the B3 to the range-topping B7. In the U.S., only the B6 and B7 are offered, which is a shame as the rest of the Alpina range is just as impressive. Unlike tuners such as Brabus and ABT, Alpina cars are actually made at BMW’s factories coming with an official three-year warranty. Alpinas do get power upgrades but they’re tuned more for comfort and refinement rather than lap times. That ethos is best represented with the B5 Biturbo. Starting off with a M550i, Alpina steps it up a notch to transform it to the B5 The 4.4-liter twin-turbo V8 gets a boost from 456 horsepower to an M5-challenging 600 HP, driving all four wheels. Torque is an impressive 590 lb-ft, which is a 37 lb-ft more than the M5. Historically, Alpina have always had more torque than their M counterparts. That results in more effortless speed. Eighty percent of the monster torque is available from 1800 RPM. A silky smooth eight-speed ZF auto is the only gearbox you get but tuned to Alpina’s specifications, but the best part about the transmission is there’s no silly “look at me” paddles behind the steering wheel. Instead, Alpina give you buttons should you wish to change gears yourself. When you just want to cruise along there’s no large paddles Suspension, brakes, and exhaust have been upgraded too. There’s more negative camber up front to reduce understeer, because that’s a no-no. The suspension of the B5 is where it really shines. I can’t think of any other performance car that combines this sort of speed with proper luxury car levels of comfort. The Aston Martin Vanquish and McLaren 720S don’t even come close to soaking up bumps like this, let along anything with an AMG or RS badge. According to Kenichi Suzuki from Alpina Japan, most of their customers have a few supercars in their garage and buy Alpina cars for daily use. These guys want the performance and exclusivity of a supercar with luxury comfort but without looking too ostentatious. Subtlety and discretion is the name of the game here. They’re fast and they’re about as comfortable as a super sedan gets but they’re not flashy or in your face. Get one in the beautiful Alpina dark green with no stripes and you’ll have the ultimate sleeper. The B5 definitely felt more at home on these larger more open roads at Yamakita than on the tighter and twister stuff at Yabitsu. It’s not quite as razor sharp as an M5, but it’s not meant to be. Carbon ceramics aren’t offered because why would they be? The four-wheel drive system is still very much rear-biased but will distribute power to all four-wheel when necessary. It might be a huge cruiser but it was still quite fun to throw around corners. There’s something very satisfying about flooring a 600 HP luxury sedan around a corner and it just flying out the corner with no frills. After driving around Yamakita, I headed off to the nearby Lake Yamanako to get photos of the B5 under Mount Fuji during sunset. The drive to Yamanako is always a fun drive taking you down Route 730 with views similar to that on the Venus Line, except with the addition of Mount Fuji dominating the view out your windscreen. Even though it wasn’t off to a good start it ended up well. I didn’t except to find a road as fun and different as the ones near Yamakita and it was a good opportunity to visit Yamakako again. The best thing is next time I’m at Fuji Speedway and have time to kill, I can visit this road for a couple of quick blasts. The drive back to Tokyo on the motorway felt much more like the B5’s forte. This car was made to dominate the Autobahns so anything less is child’s play. I couldn’t help but think the wagon version of this car (yes, Alpina will sell you a fast and comfortable twin-turbo V8 wagon where BMW won’t!) would be perfect for an American road trip. V8 power, masses of torque, a comfy ride, and enough space to fit all your Big Gulps—it’s just a shame Alpina don’t sell them over there.